It is so annoying (sad, disheartening…), for lack of a better word, when I hear people refer to the”Battle Flag” as the “Stars & Bars”. People, people, people… PLEASE get it right…. and this photo of the Confederate flags and the below quoted text, both from pages 349 and 350 of 100 Great Battles of the Rebellion by Wesley Potter Kremer found at the Internet Archive, will help you learn the difference. "A— The Stars and Bars.B-The Battle Flag. C— The Camp Flag.D — Last Flag of the Confederacy. In March, 1861, the Confederate Congress adopted as the national emblem the so-called "Stars and Bars.It was made up of three horizontal bars of red, white, and red, with a blue union in the upper left-hand corner, on which were displayed thirteen white stars in a circle, thus giving the historical red, white, and blue, which tricolor appeared in all the succeeding changes. 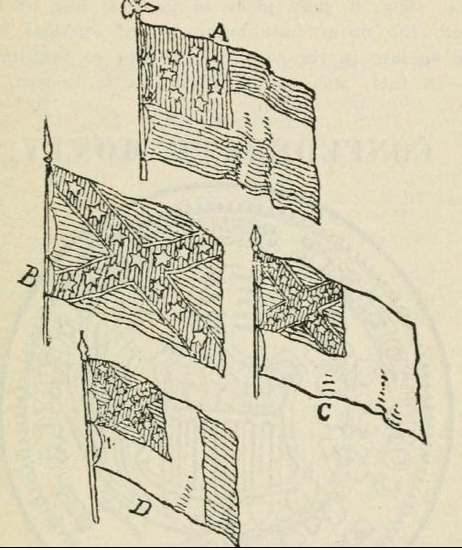 The resemblance of this to the "Stars and Stripes" led to confusion, mistakes, and loss of life in the battle of Manassas, and shortly after that action another flag was born to the Confederacy, in September, 1861. 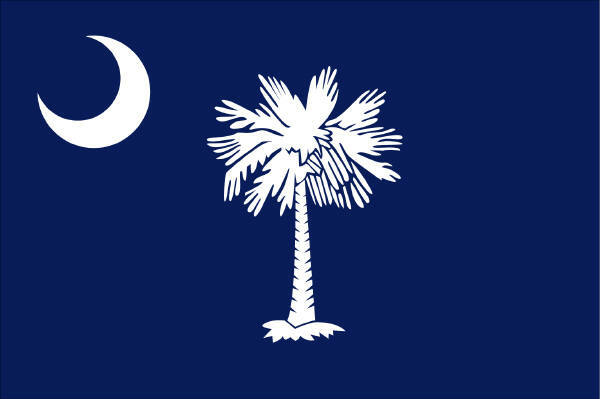 The battle flag was then adopted. This, in the language of heraldry, was a red field charged with a blue saltier, with a narrow border of white, on which were displayed thirteen white stars; in other words, a blue St. Andrew's cross on a red ground. This was easily distinguishable, and was never changed. The stars and bars were in '63 supplemented by the camp flag. This was in size and shape like the other, except that it was white with no stripes, and the battle flag in the upper corner, next the staff. It was found deficient in actual service, in that, displaying so much white, it was sometimes apt to be mistaken for a flag of truce, and on Feb. 24, 1865, it gave place to the last flag of theConfederacy, the outer half being a red vertical bar.Appearing so late in the war, it was not so familiar as the others — in fact, was comparatively little known." Even all the way out here, as far West as you can possibly go, there's Civil War history. 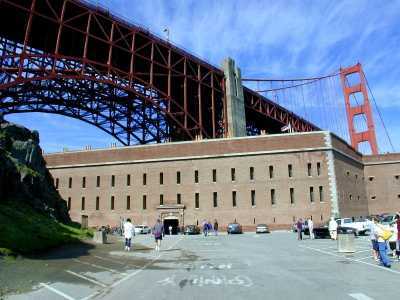 I live just a few miles north of the Golden Gate Bridge, and Fort Point sits at the base of the bridge on the San Francisco side. I went there today for Civil War Living History Day. I was lucky enough to get a good parking spot after traversing the parking lot only once, and I couldn't believe all of the salt on my windshield when I got back to the car. And I am glad I was dressed for it. Fort Point is one of the coldest, dampest, windiest places ever. I didn't get to talk to the Washer Woman as she always had so many people around her, or see and hear the Brass Band concert as it wasn't until 4, and I had been there since 12:30 and had seen it all by 1:30, but I stuck around until 2 when they had a Fife and Drum exhibition and then I sat in the warm car and watched the Bay view, the tide, the windsurfers, the Bridge and the scenery for a tiny bit and then headed home and stopped at In & Out Burger. I wish they had put some kind of schedule of events on-line, if I had known there was a Brass Band concert at 4 I would have made the trip a bit later in the day. I did see everything at the Fort that there was to see. I walked all around the dark corridors and weird hidden alcoves and went up and down the awesome stone spiral staircases several times just for the fun of it. Boy that place was DARK, even in broad daylight. I wonder how many lamps they had to keep burning to be able to see their way around? There were re-enactors of all kinds, but I didn't see one Confederate. I spoke to some of the Sons of Union Veterans and played some games with them. They had these wooden toys – cups on sticks with a ball or ring tied to it and you had to get the ball in the cup or the ring on the hook. I spoke with a Zouave and he likes to pattern dance. And then I visited the Infirmary, and was given a Curiously Strong does of Opium for the pain of having my blood let… but it was really only a wintergreen Altoid. There were Artillery and Infantry Drills, but no "fighting", this event was about the cultural history of the period, not warfare and gun-fire. The Fife and Drum Corps played a few tunes whilst I was there and got hearty, rousing applause from the audience and while listening to them I was sitting on a bench pretending I was a captured Confederate spy. You can see photos of the last CWLHD they held at Fort Point back in January 2010 on Ranger Craig's Flickr account, you can also do a general search on flickr for "Fort Point Civil War", and you can learn more about Fort Point at the NPS site. Ever wonder who the BILLY GILMER GREYS, the HAW RIVER BOYS, or the PAINT ROCK RIFLES were? This handy little manual will tell you. I found it very interesting to see the great nick-names each Confederate Company had. I hope you will too. WARNING: THIS POST CONTAINS A MOVIE ENDING SPOILER! The other day I decided to take a break from reading Civil War books and watching civil war movies, so I picked an old dark house murder mystery from 1941 to watch over at the Internet Archive figuring that was as possibly far from Civil War history as I could get… I was wrong. It was called Murder by Invitation, and was based on a group of relatives trying to get their wealthy, crazy Aunt committed to insane asylum so they could get at her money – all three million dollars. The Judge deems her sane, and she invites all of her relatives out to her country house (with secret passages and everything else spooky) for the week, and she tells them the money is hidden in the house somewhere and she'll give it to the one of them she likes best at the end of the week… and they all start dropping like flies and everyone thinks it's crazy Aunt Carrie doing her relatives in for revenge for trying to get her committed. I think she was crazy because she decides to burn the house down to see who'll run back in for the money… which she had offered one of her guests (but he wasn't a relative) 10,000$ to hide for her. They catch the murderer, and when she goes to pay the guest for hiding the money, we find out that she was one of the Original Denhams, a "First Family" of Virginia, and her money was all in CONFEDERATE DOLLARS! WHAT A TWIST! WHAT A HOOT! I tell you I never saw that coming. Aside from the DELIGHTFUL, DELICIOUS ending, I really liked that movie quite a bit. It was original, suspenseful, funny, well-acted and kept my interest. I highly recommend watching it if you have an hour to spare. There are so many Civil War diaries out there, all different. I've read a few, and have tried especially to read Mary Boykin Chesnut's Diary from Dixie THREE TIMES now, and never getting very far and having to return it to the library. I know it's online, but I like the tactile experience of turning pages. I like the book just fine, but the copy at my library has such small font, and Mary was quite verbose and no matter what volume you read they're all tomes. Anyway, I check Gutenberg every morning to see what new books have been posted, and this morning I saw another Civil War diary – Civil War Experiences under Bayard, Gregg, Kilpatrick, Custer, Raulston, and Newberry, 1862, 1863, 1864 – and took a look as I always do. They're usually dull and boring, but not this one. The content is as full and rich as the title is bone dry. I was captivated before the end of the first sentence. I'm not yet on page 5 and I had to start this post as the book is so engaging I just knew I was going to post about it. *"That night I went to my home, at Dobb's Ferry, on the Hudson River, and reported what I had done, intending to leave for Washington the next morning, when I was promised transportation. This interview with my parents was quite unpleasant, as my father was very angry and my mother in great distress. At that time both my father and his friends regarded my action as worse than foolish and almost as bad as though I had done something disreputable. Indeed, as I was afterwards informed, one gentleman remarked, "Well, that is too bad; that boy has gone to the devil, too. *"The following morning I bade my parents good-bye, feeling that if I were wounded or crippled I should not care to return home for them to take care of me. Subsequent letters from home, however, removed that feeling." WOW. That's some deep sentiment. And then he speaks of the beginnings of his trip to meet his regiment, and the part inbetween about his filling out his own enlistment papers and the armless man entering the recruiting station were amusing too, and then there was this part about him selling his civilian clothes and the buyer deserting… and we aren't even on page 7 yet and I can't post everything he wrote, but this part about the pickles and ice cream made me chuckle. *"On landing at Walnut Street wharf I went into the soldiers' refreshment room, maintained by the citizens of Philadelphia, which was open night and day, and at which all soldiers passing through the city were fed free of charge. It was about two o'clock in the morning, very hot, and I was tired and depressed. Hence, when invited to partake of some refreshments, I was unable to do so but contented myself with eating a few pickles." *"On arriving in Baltimore I walked to another part of the city to take the train for Washington. Meanwhile I wanted some breakfast. Going into a place which I supposed was a restaurant, I found that the only thing they could offer me was ice-cream. I thereupon ate some, and soon after took the train for Washington. In a few moments the Philadelphia pickles, the hot night, and the Baltimore ice-cream produced most severe cramps, and I was in a very distressed state of mind, fearing that I would never be able to reach the front, but would have to submit to the mortification of being returned home." And I just know there's a joke in there about keeping your nose to the grindstone somewhere…. *"On this raid the regiment destroyed considerable property, and many of the men carried away all sorts of things for which they had no use. Indeed, I heard Colonel Kilpatrick laughingly remark that one fellow, in his zeal to have something, actually had a grindstone on his saddle in front of him. After carrying it about a mile he concluded, however, that he had no further use for it, and dropped it in the road." That's most of chapter one, and if I haven't sufficiently piqued your interest nothing in chapter two will. *Book excerpts taken from Project Gutenberg's copy of Civil War Experiences under Bayard, Gregg, Kilpatrick, Custer, Raulston, and Newberry, 1862, 1863, 1864 by Henry C. Meyer. If you enjoyed this book, or just like Civil War diaries I highly recommend Alf Burnett's Incidents of the War: Humorous, Pathetic, and Descriptive; and I do have a particular favorite, but I am saving that one for a post of its own, so I'll mention Sarah Dawson Morgan's A Confederate Girl's Diary instead. I don't want to get to into the history of the automobile, because, if truth be told, I just don't care. But, I do know cars were not around during the Civil War. Those soldiers had to walk or ride horse-back everywhere they wanted to go. I am pretty dependent on my car, I couldn't image how I would have made it across the country the three times that I have if I had to take the train, walk or ride a stagecoach or on horse-back. I can't imagine what it must have been like to not even KNOW OF cars. I did have a horse when I was in my teens though. I can imagine what it might have been like to ride him everywhere. But entering into battle on his back? I admit, that is beyond my imagination. I once rode a rather high-spirited Palomino that took off with me at a full-on gallop of five thousand miles an hour, I can not even begin to conjure in my mind what it would have been like to have been riding that fast with the enemy charging me with bullets and swords flying every which way. I read something this morning (on wikipedia) about how if you were in the Cavalry you had to furnish your own horse and if it became lame or was killed you had 60 days to go home and get another and return to camp, or you'd be "demoted" to the infantry. You had better have hoped that you could even make it home and once you got there that your home and stables weren't pillaged in your absence… and then that you could make it back to camp without being captured or killed. And what it must have taken to feed, saddle, bridle and shoe all of those horses, not to mention all of the mucking out that must have been done. But it's that unfortunate ride on that Palomino that gives me my present day appreciation for what it took to be in the Cavalry. Which brings me back to my point, The Confederate Cavalry. 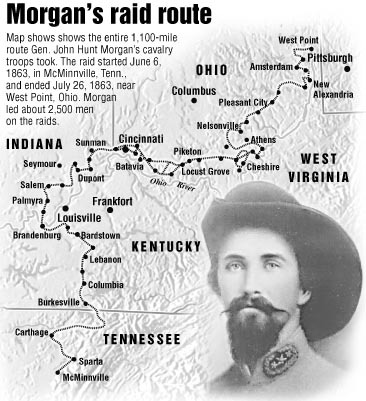 It was on this day, July 26, 1863, that John Hunt Morgan surrendered to Union troops after his unsuccessful foray into Southern Indiana and Ohio, known as "Morgan's Raid". And I know I either read or saw something about his escape from prison after being captured. I am not helpful at all, I know…. I do recall a great juvenile fiction series book I read by Byron A. Dunn called Raiding with Morgan. It was a very enjoyable read and I recommend it highly. I'll let you know when I find that video clip…. Photo of Morgan's Raid map used withOUT permission from strattonhouse.com. Until then, watch some videos at the Internet Archive. Out of three seasons and ninety-eight episodes, only one episode of ONE STEP BEYOND was made about the Civil War. A Pictorial History of the War for the Union, Volume 2, by Ann Sophia Stephens has an amazing FOUR PAGE table of contents which alone is well worth reading. Volume One is well-written, easy to read and interesting, but the Table of Contents from Volume Two is really quite REMARKABLE…. Four years worth of Civil War history boiled down to four pages, remarkable – I say. You've heard of Mississippi. Well, I have a boy cat and I call him Mister Ssippi, because he sure ain't no "Missis". Everyone, myself included, goes on about Gettysburg every Fourth of July. However, I don't feel that Gettysburg could possibly have had as deep or profound effect on the residents of the Cumberland Valley as did what the people of Vicksburg had to endure being surrounded and cut off the way they were for such an extended amount of time. So, today I want to give a nod to Vicksburg because what the citizens there went through deserves recognition. If you want to know more about it there are tons of pages out there about the Siege of Vicksburg. I found an incredible book of photos from 1902 called VICKSBURG VISTAS chock full of lovely B&W photos. Unfortunately, you can't rotate the pages so you have to either hold your computer sideways or turn your head to an awkward angle. If you don't feel like doing that, here's one (of nine) panorama(s) from the Library of Congress. It has no restrictions on publication, but the copyright claimant is listed as the Haines Photo Company of Conneaut, Ohio. "5 second fuses only last 3 seconds..."